Hi. 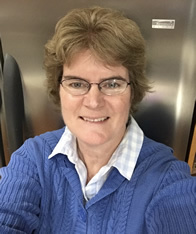 I'm Mona Stolz, the LOP Lady Niners handicapper for 2019. I hope this page is useful and answers a lot of the common questions you may have regarding handicapping. Please call or text me at 916-397-7425 or email at: mrsstolz@netzero.net if you have any questions or problems regarding posting your scores or have any handicapping questions. 1. How/where do I post my golf scores? If necessary, set up your "favorite courses" by clicking on Menu (3 horizontal lines in upper left hand corner); Select "Favorite Courses"; click on + (plus) sign in upper right corner, if course/tee is listed and you want it to be a favorite, click on it -- otherwise, click on "Search" button; In field under "California", type in the course (i.e. Lake of the Pines) and click "Search" button. The course should be listed. Select the course by clicking on it. If you searched for Lake of the Pines, and selected it, then select the color tee that you want to be your favorite ((Green, Gold, or Red). App will return to your list of favorite courses. Click on back arrow (upper left hand corner) to return to home page. From home page, click on "POST SCORE"
Click on "9 HOLES" Click on Favorites or Recent tab (If Lake of the Pines CC with correct tees, and course (Front 9 or Back 9) doesn't show up, you will need to select "Search". Click on correct tee/course (i.e. Green-Front 9 or Gold-Back 9). If Front 9 and Back 9 aren't showing up, you will be posting an 18-hole score so make sure you have selected 9-Holes tab. Next screen will have SELECT TYPE DATE, ESC box, and Post Score tabs. Click on "Select Type". If playing at LOP, click or select "HOME". If playing elsewhere, click on "Away". Date defaults to current date. If posting a score form a previous date, click on date field and enter correct date. Click in ESC box. Type in your Adjusted score (see later sections on "What is ESC and What is an adjusted score for complete explanation on what they mean and how to calculate. Look over screen one last time checking to see that the tee/course, type, date, and ESC information is correct. Click on "Post Score"
CONGRATULATIONS! You have now posted your score!!! Using the mouse provided, click on "Club Member Score Posting"
Enter GHIN # and click on "Next"
Enter ESC Score (this is your adjusted score). (See "What is ESC" and "What is an Adjusted Score?" sections for more information. Review all information and click on "Cancel" if something is wrong. If all correct, click on "Post Score". Click on "Exit" when done to take computer back to home page. Near the top center of the website page, click on "POST SCORES". Enter your GHIN # and last name and click on "Continue"
Fill in all of the fields including: date you played golf, select 9 holes, look up course (if needed), select tees you played from, and enter your adjusted score in ESC Score field (see below). Once everything is completed and correct, click on POST SCORE. So, for example, at LOP, you may have a handicap of 19 on the front nine and a handicap on the back nine of 21. Therefore on the front nine, your ESC would be 9 and it would be 10 on the back nine (using chart above). ESC comes into play when you are adjusting your score for posting! 3. What is an Adjusted Score (ESC Score)? View Answer / Hide Answer. Adding up your actual strokes for each hole to get a "gross" score. Next, you "adjust" this gross score by subtracting any ESC (see ESC section above). This "adjusted" score is the score you post! Connie has a handicap of 27 for LOP Front Nine, Green Tees. Connie's ESC is 10 (most strokes allowed for any hole and using chart above). Mary's gross score is 65, but she had 11 strokes on Hole 8. Mary's adjusted score is 64 and that is the score she posts. Martha has a handicap of 13 for LOP Back Nine, Red Tees. Martha's ESC is 8 (most strokes allowed for any hole and using chart above). Martha's gross score is 51, but she had 9 strokes on Hole 5 and 10 strokes on Hole 8. Since Martha is only allowed 8 strokes per hole, she adjusts her score down by 3 strokes (1 for Hole 5 and 2 for Hole 8). 51-3=48. Martha posts a score of 48. Unfortunately, you cannot change anything once you post your score. However, the handicapper can!! Contact handicapper as soon as possible to assist. sweeps or from Handicap sheet in pro shop, Niner hallway, or Tournament Table binder) ("HCP" column on scorecard) (If player does not have a handicap yet, put N/A here). The handicap index is "a measurement of a player's potential ability on a course of standard playing difficulty," according to the USGA. The golfer uses the handicap index to determine their handicap at a particular course, based on the difficulty of that course. Your 18-hole index can be found on our monthly Handicap Report posted in the Niner hallway and on the Niner sign up clipboard in the Pro Shop. 9-hole index is 1/2 of 18-hole index (rounded to the nearest 10th). Defined by Wikipedia: A golf handicap is a numerical measure of a golfer's potential ability. In stroke play, it is used to calculate a net score from the number of strokes played during a competition, thus allowing players of different proficiency to play against each other on somewhat equal terms. Generally, your gross score minus your handicap (net score) should be equal (or close to "par" for that course). For example: Looking at a scorecard, you may see that the 9 holes you are playing is a par 35. If you have a handicap of 20, you would expect to see your gross score to be around 55. If you play better (less than 55), you are playing really well and you should see your handicap improve if you continue to play with those scores. If you score above 55, you are not playing as well as your handicap indicates and if you continue with higher scores, your handicap will go up over time. You can find your handicap for LOP in several ways (in the Pro Shop on the Lady Niner sign up clipboard) or on the monthly Handicap Report posted in the Niner hallway. Handicap calculation: 9-hole Index multiplied by course slope divided by 113. For example: If your 9-hole index is 30, your handicap for LOP Front 9, green tees (slope 116) is: 30 x 116/113 = 31. Your 18-hole index is listed on monthly handicap report in the pro shop on the Lady Niner sign up clipboard or in the Lady Niner hallway. Divide by 2 to get your 9-hole index. A course's slope can usually be found on a scorecard (if it is up to date) or on GHIN. The 113 in the formula is a constant (it never changes). If you have the GHIN app on your phone, click on C.H. Calculator. It defaults to 18-hole index. You can manually revise that to 9-hole (divide by 2). Then use the slope rating bar and slide over to the slope of the 9-hole course (also need to know the color tee). Your course handicap will show up in that field. I think the best way for me to describe a "pop" is that it is your handicap for an individual hole. For example, if your handicap is 27 for 9 holes, that is 3 pops per hole. As a general rule, if you add the par for a hole to your pops for that hole, that is what your handicap is expecting you to actually play for that hole. For example, on a Par 4 hole with 3 pops, your handicap would expect you to have 7 strokes for that hole. If you play less than that, you are doing well for that hole; if you play more strokes for that hole, you are not playing as well. Pops are also determined by how difficult a hole is (for example, on our course, Hole 1 (a Par 4) might be considered more difficult to play than Hole 4 (also a Par 4), so you may have more pops on Hole 1 than on Hole 4. Pops are used in Team Play and when a hole is not played (like when Hole 7 was being renovated or if you get sick and don't complete a hole such as Hole 9). The easiest way to find your pops for LOP, are the charts in your Handbook. You look up the color tee that you are playing along with which course (Front 9 or Back 9). Using your handicap, you can find your pops for each Hole. If interested in learning how to manually figure out your pops, please contact me and I will be happy to go over it with you. In general, yes, you should be posting all completed 9 hole or 18 hole golf scores (played at LOP or at other golf courses). Exceptions might be if you are in a tournament and playing "best ball" or a "scramble of some sort" where you don't play every ball you hit. Also, if you don't complete at least 7 holes of a 9 hole course or 14 holes of an 18 hole course. 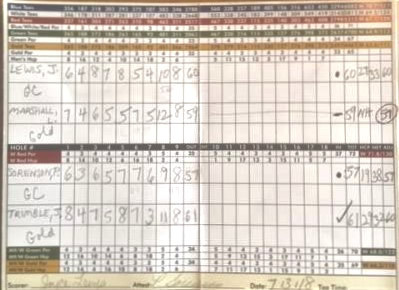 Another example of when not to post is if you are trying out a new club and the course isn't busy, and you hit two tee shots, or a handful of pitch shots on every hole (there is no way to determine what you true score is). If you aren't for sure if you should post, contact me and we will figure it out together. For a variety of reasons, sometimes you may "pick up" your ball on a hole. This could be because you went out of bounds, but did not hit a provisional ball, and there is not enough time to go back and hit again, you are playing really bad and taking up too much time and/or getting frustrated, etc. In those cases, you take your current strokes you've already hit and add strokes for what you "reasonably" think you would have to complete the hole. For example, you've hit 7 strokes, you pick up, and believe it would take another 4 strokes to complete the Hole. You write an 11x on the scorecard. The x indicates that you picked up. Depending on your handicap (ESC score) you would be posting a 7, 8, 9, or 10 for that hole. Another example is you get sick and quit playing after 8 holes and don't complete the 9th hole. You (or your teammates) would fill in "pars + pops" (Par for that hole + pops for that hole) (See "How do I find out what my pops are?" section) for that Hole and that is the score that is used for posting.